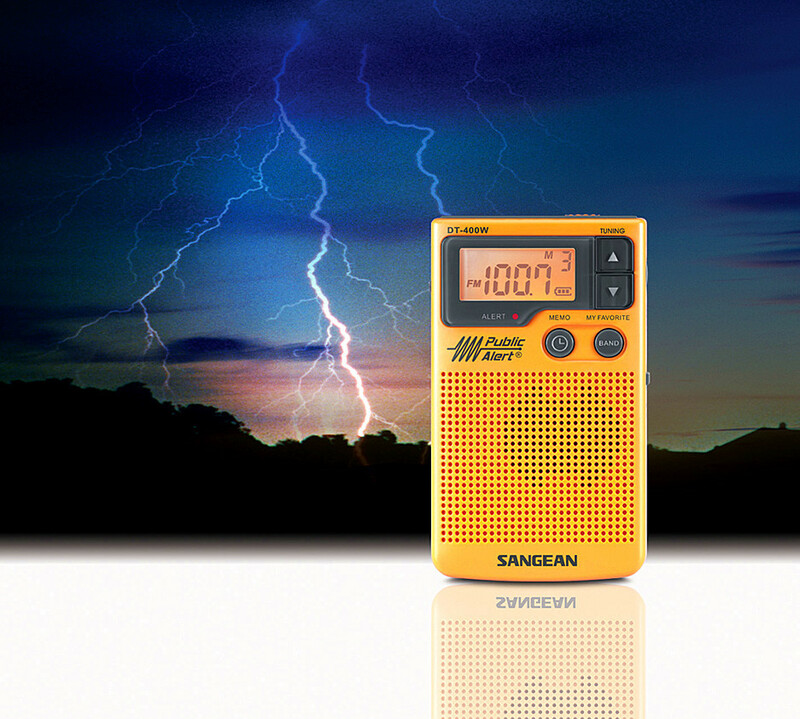 Sangean DT-400W AM/FM Pocket Radio With Weather Alerts | It’s not the destination, but the journey, that matters. Når man sitter ved leirbålet, slapper av i teltet eller av andre grunner ønsker å høre litt musikk eller få en skikkelig værmelding kan det være greit med en liten hendig radio. Så jeg bestilte meg en Sangean DT-400W. Det er en liten AM/FM radio som har fått mye skryt på nettet av andre reisende. Den veier bare 155gr inkl. batterier og har målene (L) 10,8cm x (B) 6,3xm x (H) 2,5cm. Så vidt jeg kan tolke tilbakemeldingene på nettet er de generelt bedre enn andre radioer. Det negative er antennen (tråd antenne) og at den bruker batteri også når radioen er av. Dvs. at når radioen ikke brukes kan det være lurt å ta ut batteriet eller bare snu de inne i radioen. Årsaken er at displayet på radioen viser Off når radioen er av. Selvfølgelig teit men noe jeg kan leve med. Å snu ett batteri slik at den er 100% av tar 10 sekunder. Her er hva Radiojayallen skriver om radioen. 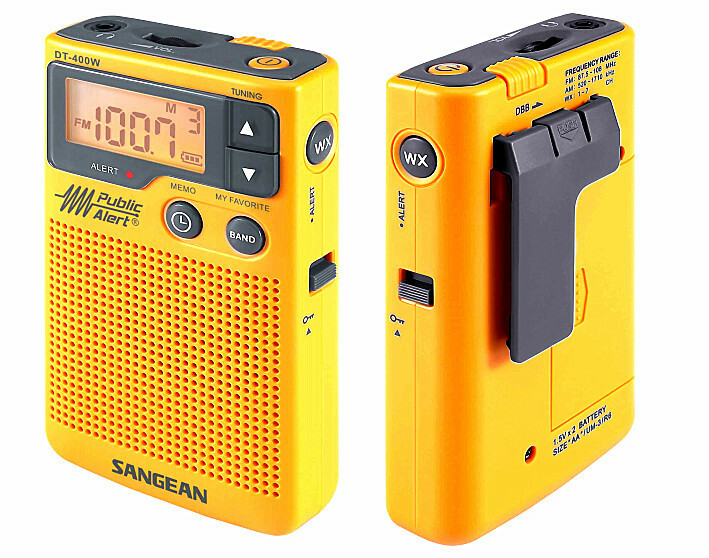 The Sangean DT400W is the successor to Sangean’s popular DT200VX Walkman-style portable radio. I’ve used one for several years and found it to be a great performer and pleasant to use. The DT200VX was a best-in-class performer during the many years it was available but I’m happy to say the new model is improved in many ways. Not only has reception been improved on all bands, but the now-defunct analog TV band audio of the old model has been replaced by the NOAA Weather Band which makes the DT400W even more useful. I also must admit I’m a sucker for the bright yellow color reminiscent of Sony’s Sports Walkman series that was so cool back in its heyday. It is available from many vendors at prices ranging from approximately $50 to $65. (The discontinued DT200VX has been replaced by the DT200X which appears identical to the older model except that the TV Band has been removed and the price has been reduced to about $45. There is some confusion among sellers such as Amazon which currently list the model X as including the TV band which has actually been deleted). Description: The DT400W is pocket-radio-sized measuring 2.5 x 1 x 4.5 inches, weighing in at 3.5 ounces and it runs on two AA batteries. It covers AM/FM/NOAA Weather Band and features not only a Weather Alert feature but a unique battery-saver features which lets you program when the alert mode is active, while a flashing LED reminds you when you are in that mode. So unlike any other NOAA Weather radio with an alert feature, the DT400W lets you actually use the alert feature without draining the batteries in short order…very clever and useful. There is also a removable belt clip, a built-in mono speaker for times when the ear buds are not being used, and since all such units use the earbud wire as an FM antenna, Sangean also provides a dummy antenna wire for use when you are not using earbuds. The radio is PLL tuned and its backlit LCD display shows time, frequency and battery life as well as timer and alert modes. There is an auto-seek mode, a defeatable sleep timer and a Deep Bass Boost switch to enhance low frequency performance through earbuds. Controls include a volume thumbwheel, a band switch with 19 presets, a “My Favorites” button, along with a Lock slider to lock out unintentional button presses either while in use or when packed. Performance: The DT400W is a real winner with stronger AM/FM reception than the model it replaces. In fact, it is as good as any radio its size I have compared it with, and better than most. Its FM reception, while not as good as my best, larger portable FM radios, is as close as it gets in this size range and is at least as good as any of the highly-touted small DSP portables on FM. In a direct comparison with the older model the DT400W is clearly more sensitive revealing many signals which are completely absent on the original model. Its AM is very good as well and again, better than most of the small DSP AM portables, and the NOAA Weather Band is also sensitive enough to bring in several active frequencies in my area which are harder to receive on many other radios. Sound through the included earbuds is satisfying and full, although I do have other earbuds I prefer. The bass boost feature is pleasant on most program material, again depending on your choice of earbuds. The internal speaker is there for utility purposes only…it does not rival the sound from the better pocket portables I have reviewed. But the Sangean is primarily a Walkman/ earbud design so I consider the speaker as a bonus which has proved useful from time to time. At any rate the rounded bottom of the DT400W’s base makes standing the radio upright nearly impossible. Conclusion: The Sangean DT400W is the finest Walkman type portable I’ve ever tested. It offers great sound, amazingly good reception on all bands, rugged construction, an intuitive feature set… and I love its looks. With exemplary performance in all modes it is highly recommended!